R2-D2 can help out C-3PO and everyone in many ways, now R2-D2 is mixing things up and is going to help out in the kitchen. 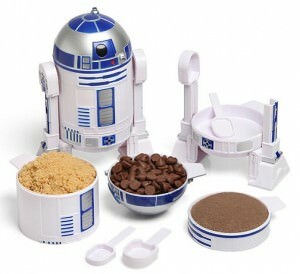 This is a really cool set of measuring cups and spoons that when put all together correctly make up a little kitchen helper R2-D2, find all the great Star Wars R2-D2 character features on each piece making it unmistakably R2-D2. The set of measuring cups include: 1/4, 1/3, 1/2, and 1 cup, and the set of measuring spoons include: 1/4, 1/2, 1 tsp, and 1/3 tbsp. this is a must have for the Star Wars fan for sure. Put R2-D2 robot to good use with the Star Wars R2-D2 Measuring Cup Set.